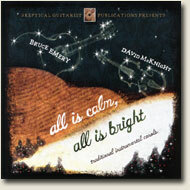 This is the new companion CD for Bruce Emery’s Christmas Fingerstyle Guitar Plain and Fancy. Bruce plays his arrangements of 16 Christmas carols, accompanied by David McKnight on violin, viola and mandolin. A perfect aide to help you learn the music from his book.